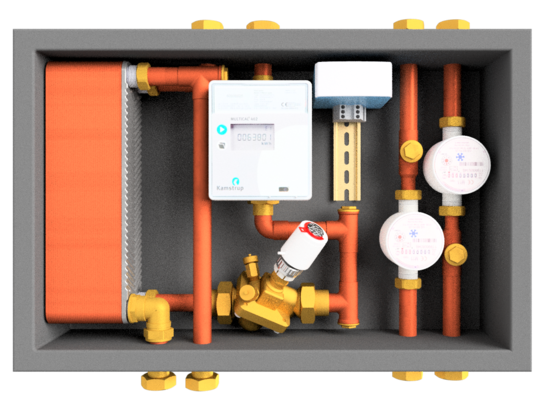 The Heat Interface Unit Utility Master provides an indirect primary interface to a heat network for up to 30kW load, and is designed to work in partnership with a hot water cylinder for DHW. The Heat Interface Unit Utility Master provides an indirect primary interface to a heat network for up to 30kW load, and is designed to work in partnership with a hot water cylinder for DHW. is fitted with two separately metered water supplies for drinking water and CWS. At only 590 x 390 x 165mm the unit is very compact, using a moulded EPP casing for insulation and structural strength, and voids within the casing are filled with further removable moulded insulation. Equipment fitted inside the Heat Interface Unit Utility Master range is limited to the provision of heat and cold water, and as such it does not include the internal heating or DHW controls. These are left to the installer, and can be maintained separately without the need to access the UtilityMaster, or break any security seals.